Two Aprils ago, I finished a manuscript that turned out to be something different than I expected. I thought I was writing a cute Christmas novella about a widowed woman overcoming her grief and learning to love and live again. Except, first, my hero wouldn’t cooperate – he insisted he was a Greek god instead of a cute snowman come to life. Then, the dang book wouldn’t end, stretching out to 65,000 words instead of the 30-40K I’d anticipated. Finally, there were these fun secondary characters waving frantically and trying to capture my attention for sequels I never planned to write. One day—just nine days before my very first book would release—an editor from this new and not-yet-opened publisher had an interview up at a blog and invited questions from blog readers. So I wrote and asked her if Entangled would ever consider novels shorter than their 70,000-word minimum specified on their then very sparse website. That turned out to be one of the best blog comments I have ever left. An amazing editorial relationship with Heather, who is tough as nails and never lets me get away with a thing. Having worked with Heather for the past 2+ years, I will never doubt the benefit of a great editor. My stories and my writing itself are so much better for having worked with her. Seriously hot, high-quality covers. 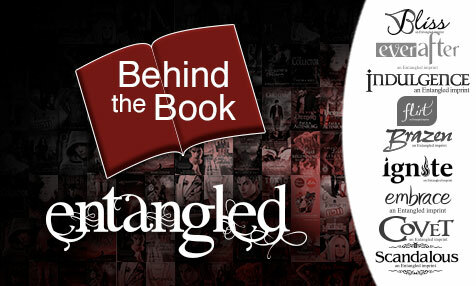 Once again, I must thank Heather, who has been the designer for all of my Entangled covers. If you likey hot men and delicious abs on romance covers, then you will fall in love with mine. For real. And any author will tell you how important a good cover is to sales. Five books, and at least four more to come. Who knew that that one query would lead to a career-defining relationship? In the past two years, Heather and I have published five books together, and we have one more Hearts of the Anemoi book, two more Heroes books, and one secret project book yet to go. And who knows what other trouble we’ll get into after that! Sales that have contributed significantly to my ability to quit my day job (not to mention gave me my first shot at hitting the NYT and USA Today bestseller lists!). After fifteen years of college teaching, I now work as a full-time writer, and that wouldn’t have been fully possible without the amazing success (not to mention luck!) that I’ve had with Entangled. Sometimes your whole life changes in the most seemingly small moments, and that definitely happened to me. And I couldn’t be happier. I love your books, and totally agree with you. Entangled Publishing and Heather Howland can’t be beat when it comes to an awesome publisher and their editorial team. Thanks, Jan! You’re the sweetest!